In a medium bowl, mix the yogurt with the chopped parsley, tarragon and chervil and season with salt and black pepper. Cover with plastic wrap and refrigerate the herbed yogurt until chilled, at least 15 minutes. Meanwhile, in a medium saucepan of salted boiling water, blanch the peas until crisp-tender, about 1 minute. Drain well and let cool. In a large food processor, pulse the 1-1/2 cups of peas with the egg and egg yolk until the peas are finely chopped. Add the cream, flour, lemon zest, baking powder, cardamom and cayenne and a generous pinch each of salt and black pepper; pulse until the batter is nearly smooth. Heat a large cast-iron skillet or griddle. Generously grease the skillet with butter. Spoon 1-tablespoon mounds of batter into the skillet and cook over moderate heat until lightly browned on the bottom, about 2 minutes. Flip the pancakes and cook for 1 to 2 minutes longer, until lightly browned and cooked through. Transfer the pancakes to a platter and keep warm. Brush the skillet with butter as needed and repeat with the remaining batter. 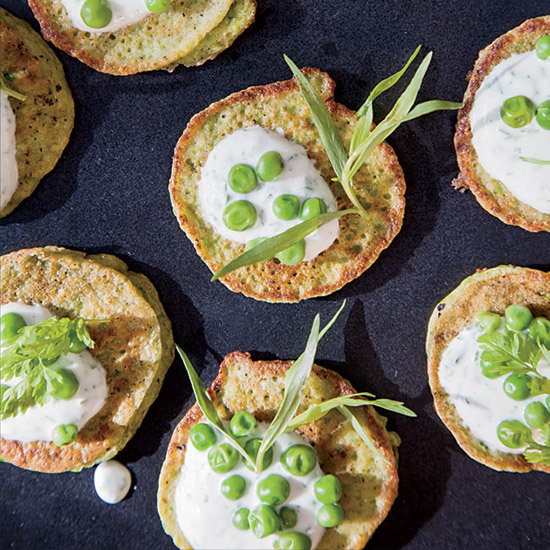 Serve the warm pancakes topped with the herbed yogurt and garnished with peas and herb sprigs. The herbed yogurt can be refrigerated overnight.